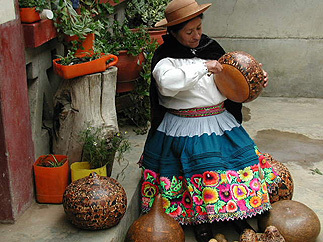 About six miles outside of Huancayo, Peru discover a little village called Cochas Chico and Cochas Grande. This village has much to offer the traveler, including great biking trails, fun festivals and award winning gourd carvers. 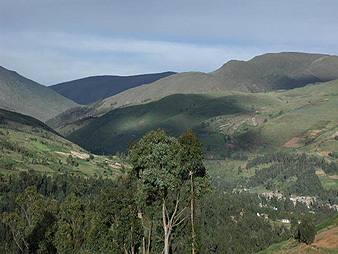 The town of Cochas sits at 11,000 feet. Cooking Pachamanca. Famous in the Peruvian Andes especially in Cochas. Pachamanca is a word used to describe not only the way this meal is cooked, but also its ingredients. 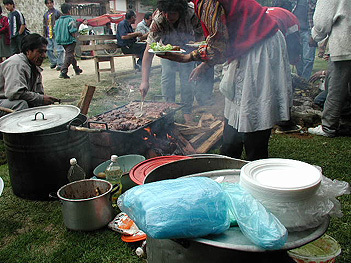 Pachamanca is cooked from ovens built into the ground. Hot bricks, coals, and other warming utensils help to cook this enormous meal that feeds up to 100 people and takes over eight hours to cook. The meal consists of sweet potatoes, beef ribs, and huge green beans. Quite a tasty start to your hours of festivities. 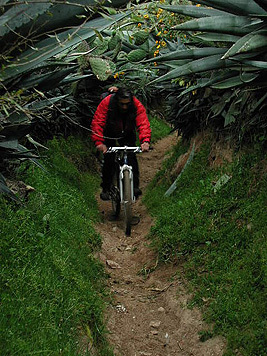 Bike Trail that runs between Huancayo and Cochas. The ride over to Cochas is great fun, featuring steep single track, big rocks, and fun drop offs, not to mention views that run forever. This Champion Gourd Carver has been featured all over the world and has won more awards than anyone in South America. Her name is: Delia Poma. These gourds are dried pumpkins that are hand carved and tell stories of their lives. Some Gourds can take three days to carve while others may take a month. Cochas has much to offer and enjoy throughout the year. *Feature written and photographed by Phillips, May 2001, who visited Cochas on several occasions. Delia Poma showed us examples of her work as well as her many awards. Altitude was measured with an altimeter reading on three different visits and re- calibrated for accuracy.